All scans are saved to a CD or DVD and returned to you along with your plates. 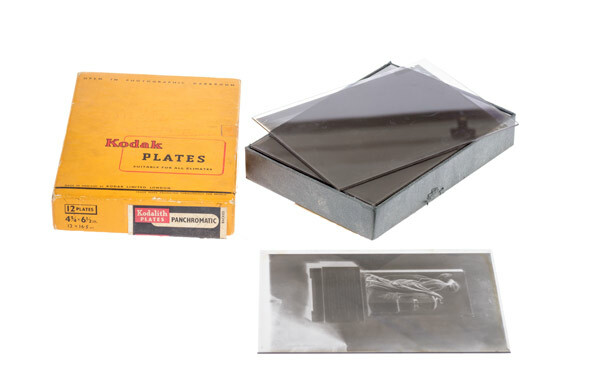 • Half Plate negatives are provided in two resolutions, automatically. One file at 3200 ppi and another at 1200 ppi. This 3200 ppi version results in an extremely high resolution file that allows you to selectively crop the images while still maintaining high resolution. Scanning at higher than 3200 will not yield more detail; it will only increase the file size. The resolution of the grain in the emulsion has been exceeded already by the 3200 ppi scan. The 1200 ppi scans will be in a separate folder on your disc. Even these scans will be sufficient to print the whole image - even to poster sizes. As well as receiving all of your negative or photograph scans on a disc, you can also purchase printed photographs of any of your scans. Photographs are printed using Fuji Frontier mini-labs on Crystal Archive paper. This means that the quality and longevity of your photographs are ensured. Bring your plates to our studio at the address below. Post your plates to the address below. If you choose to post your plates, please ensure that you have packed them securely. If you choose to bring your order to our studio in person, please take note of our opening times at the foot of this page. Postage and packing costs for Glass plate orders is £3. If you have any questions regarding our scanning service, please enter them in the box above.